I recently applied for and have been approved for a US Tourist Visa. I have heard a lot of stories about people getting denied hence I was apprehensive in applying for one. The high visa refusal rate, in fact, isn't true. According to this site, the visa refusal rate for the Philippines is 33.8%, which means you have almost 70% chance of getting approved. I applied for a B1/B2 Non-Immigrant Visa. B1/B2 is the US visa code for temporary visitor for business & pleasure. Note that this post is written according to my personal experience. 1. 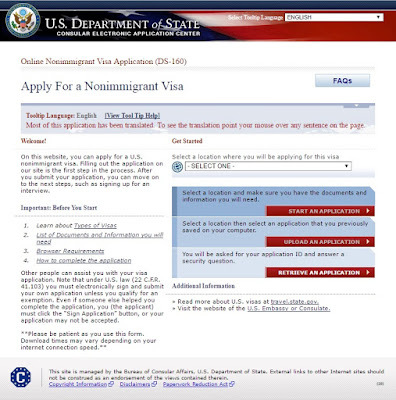 Accomplish the Online Non-Immigrant Visa Electronic Application (DS-160). Go to https://ceac.state.gov/genniv/ to fill out your application form. This form will be the basis of the questions that will be asked during your interview. You don't need to complete this form in one sitting (and I highly recommend that you review your form thoroughly). Your application form can be retrieved from the site for one month, you only need to remember your Application ID. It took me at least 2 weeks to accomplish and submit my form. I had to review and edit several times to make sure I don't overlook any detail. I finally submitted it 3 days before my appointment. 2. Upload a digital ID to complete your application form. You will need to bring a 2x2 ID photo during your interview, you will also need a digital copy to be uploaded with your application form. 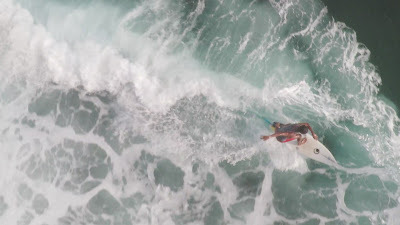 Your photo should be not digitally enhanced (not photoshopped) and should comply to the requirements. I had my photo taken at Photoline with a CD copy for only Php 135. You have to tell them that it's for a US Visa. 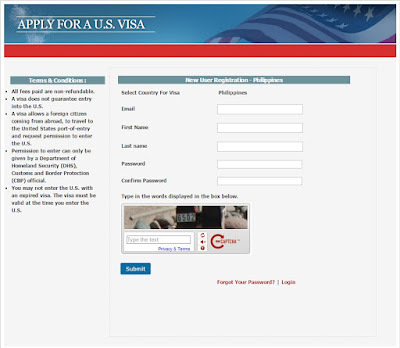 Create an account at this link to pay for your visa fee. After your visa fee is paid and confirmed, you can already schedule an appointment. A reference number will be given to you for the visa payment, please take note of this reference number. 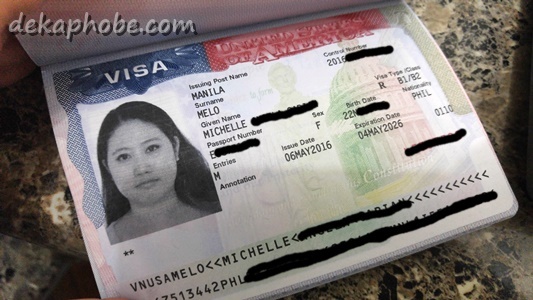 The visa fee for a B1/B2 visa application is $160 or Php 7680 paid via BPI. Instructions for the US Visa Fee are posted here. The cold Tagaytay weather had the boyfie craving for something with hot broth, and because we want to try something else (aside from the good ol' bulalo), we decided to try Korean Shabu-Shabu at Ci Yoo Korean Resto. Korean restaurants are everywhere, that even the area where I live has at least 5 Korean restaurants along the street. 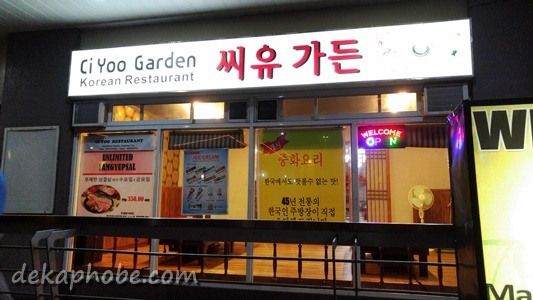 However, I was still surprised to find a Korean place in Tagaytay. 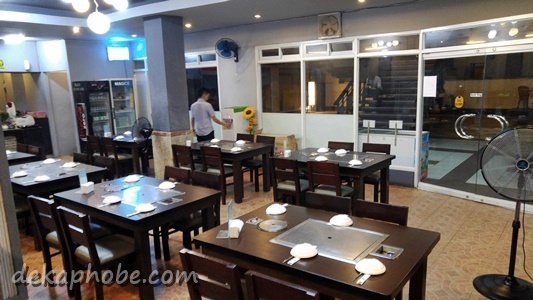 The place looks quite typical for a Korean resto, with semi-private booths and a private room. The boyfie and I were seated at one of the semi-private booths. For our dinner, we ordered the Beef Shabu-Shabu for 2 (Php 900). 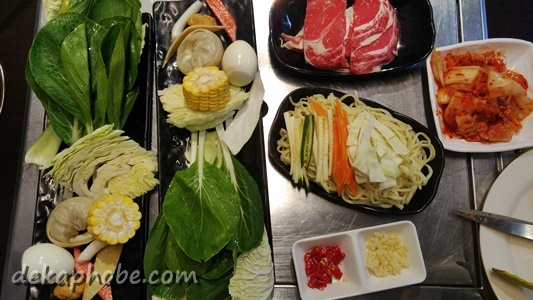 The Beef Shabu-Shabu Set has Australian Wagyu Tenderloin, two sets of veggies and other shabu shabu toppings (like egg, Korean dumplings, crabstick, etc) and noodles. After my Oriental Cooking Class with Kikkoman at 25 Mushrooms Kitchen, I was inspired to create more dishes using Kikkoman Soy Sauce. Here's a simple recipe that you can do in a matter of minutes. 1. Marinade the chicken wings in Kikkoman soy sauce. Ideal is overnight but one to two hours will be okay. 2. Saute the grated ginger. Add the chicken wings. Fry both sides. 3. Add the water, soy sauce, and sugar. Stir until the sauce thickens. 4. Coat the wings with the thick sauce. Served with sesame seeds sprinkled on top. Share your own #CookedWithKikkoman Recipes with me and get a chance to win a voucher from 25 Mushrooms Kitchen! Read the mechanics here. Get Your Tastebuds Ready for the Wingstop Flavor Invasion! More than your average wings restaurant, Wingstop is ready to invade your senses and entice your taste buds as it lets flavor enthusiasts experience all 14 of their flavors through the Wingstop Flavor Invasion. 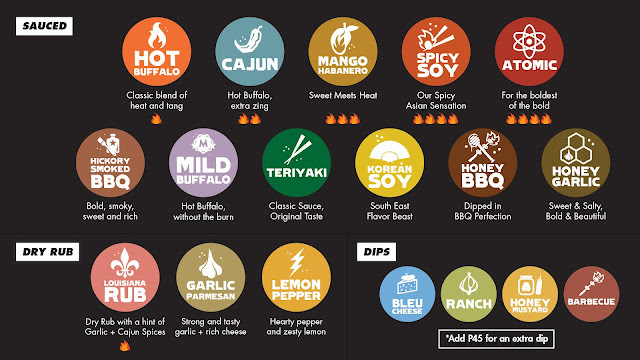 Wingstop’s flavors are taking over and they won’t take no for an answer. Whether you’re craving for the classic spice of Hot Buffalo, the smooth taste of the Hickory Smoked Barbeque, the sweet heat of the Mango Habanero, or the Oriental taste of our Asian Flavors, the Wingstop Flavor Invasion will get everyone to come back week after week just to satisfy their every craving. What’s more, Wingstop wants their customers to give in to the Wingstop Flavor Invasion through the Flavor Pass. Available from May 23 to August 31, 2016, the Flavor Pass is redeemable with any single receipt purchase at any Wingstop store. Collect stamps for every flavor that you try and earn yourself Php 1000 gift certificates for every Flavor Pass that you complete. But that’s not all, customers get extra wings with every purchase of the Classic or Batter-Fried Wings. So if your appetite requires a 5-piece, you get 1 piece free. If you’re craving for a 7-piece, you get 2 wings for free and if you order an 11-piece, you get 3 free wings with your purchase! The Wingstop Flavor Invasion gives you the freedom to explore and try the many different flavors that Wingstop has to offer. So if you’re looking for the heat of the Atomic but want the zest of the Lemon Pepper on the side or if you’re craving for the sweet and salty taste of the Garlic Parmesan but are raring to try the Asian kick of the Spicy Soy, the Flavor Invasion is your best bet for your next flavor adventure. Ippudo Philippines has officially opened its 3rd branch in Manila, at the newly-opened Uptown Mall at BGC last Friday, May 20. But before that, I got a chance to drop by the newest Ippudo branch last Wednesday. Ippudo BGC has more than 100-seating capacity. The high ceilings and the minimalist interiors makes the restaurant feel very spacious. For this visit, I had two of my favorite Ippudo side dishes, the Fried Chicken Bun (Php 125) and the Deep-Fried Gyoza (Php 220). 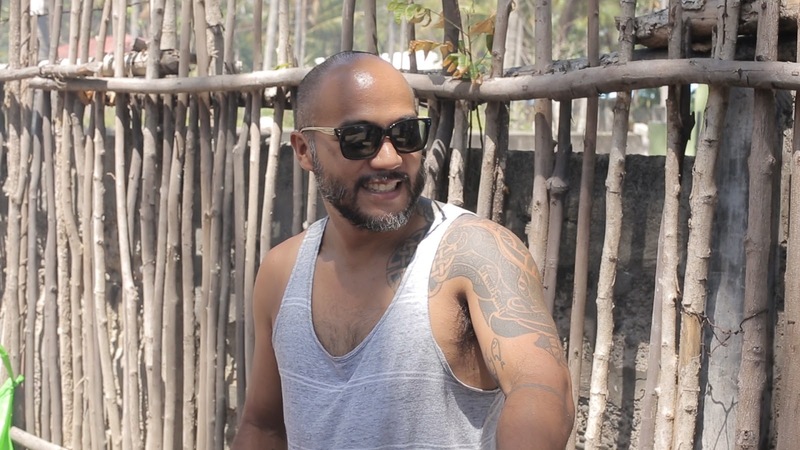 For acclaimed chef JP Anglo (Owner of Sarsa and Kafe Batwan restaurants and judge at Master Chef Philippines), conquering his fears to live out his passion is definitely worth it and makes him a step closer to truly living life to the fullest. Yabu Katsu Pairs and Tofu Katsu! My favorite katsu restaurant, Yabu: The House of Katsu never fails to surprise me with new dishes every now and then. Introducing the Tofu Katsu and the Yabu Katsu Pairs! The new appetizers in the menu, the Tofu Katsu has two kinds: Tofu Katsu with Uni (Php 250) and Agedashi Tofu (Php 220). Each serving has three huge pieces of Japanese tofu with panko crusts. The Tofu Katsu with Uni is topped with fresh uni (sea urchin), nori, spring onions, bonito flakes and served with creamy uni sauce while Agedashi Tofu is topped with bonito flakes, grated radish and served with soy dashi sauce. I really love both, but I recommend that you try the Tofu Katsu with Uni if you're into creamy but have the Agedashi Tofu if you like salty. Yabu has five Katsu Pairs with either Chicken Katsu or Rosu Katsu. My friend and I has recently tried this new burger place at The Grove by Rockwell named BurgerPub, which opened early this year. Unlike the usual burger places that I go to, BurgerPub strikes me more as a pub than a burger restaurant. As much as I want to have some beers with my burger, I'm really more of a burger-and milkshake person, so we stuck with getting just the burgers. For starters, we shared a plate of Belgian Frites (Php 190). Because of the price, I was expecting something more elaborate but we were served something a bit ordinary. Anyway, I love fries so it wasn't so bad. For Filipinos, going out to eat is not just about enjoying good food but also an opportunity to bond and spend quality time with friends and family. Also, it is a special time to reconnect with loved ones, which is why finding the perfect setting is so important. However, with the increasing number of new concepts restaurants around the metro, choosing a dining option can seem endless. Sometimes, all you want is something familiar, a place that feels like home, with a menu that you know by heart, where you know exactly what you are getting. A place you know you will surely have fun with your friends and family. 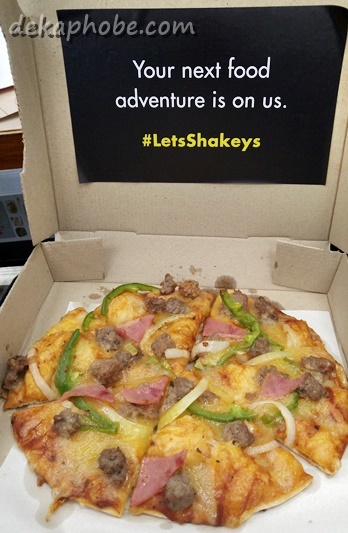 That place is Shakey's - where all you need is one word to express what you mean, where all you need to say is "Let's", when you want to go to Shakey's. 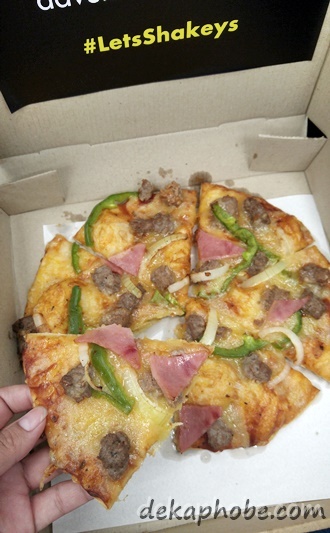 Famous for its Thin Crust Pizza and Awesome Twosome Chicken N' Mojos, Shakey's is everyone's favorite fun, family, pizza restaurant-the place we all like to go back to visit, time after time. Growing up, Shakey's may have been the first venue for milestone celebrations, but it has now evolved into a place here Guests can simply get together to have a good time and make great memories, with or without an occasion. With menu favorites that are consistently delicious they might as well be considered iconic, Shakey's never disappoints when it comes to satiating your food cravings whenever you visit. [UPDATED] #CookedWithKikkoman Giveaway: Win a Voucher from 25 Mushrooms Kitchen! 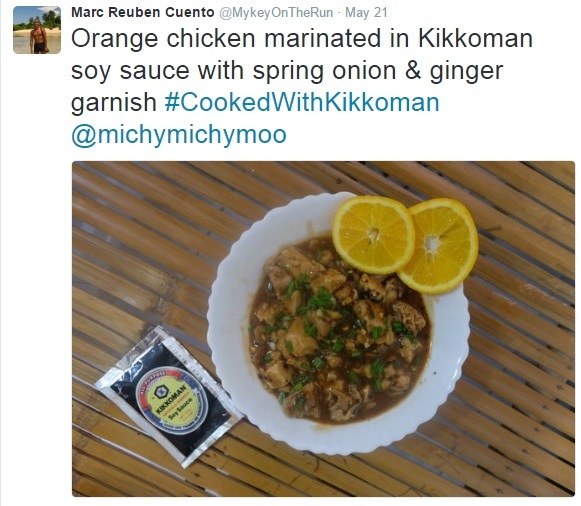 Joining is so easy: simply post a photo of any dish you cooked with Kikkoman on Facebook, Twitter or Instagram. 1. Post a photo of a dish you cooked with Kikkoman. Don't forget to post the name of the dish. 3. Make your post public so I can see it. You may post at all of these social media channels, so you can have a maximum of three entries. This giveaway will end on May 31, 2016. I will choosing one winner on the 1st week of June. Thanks to Kikkoman for this amazing giveaway. Good luck, foodies! Note: This location is already closed. The city of Marikina has grown from being the shoe capital of the country to being one of the most popular foodie spots in the metro. One of the newest additions to Marikina's growing list of restos is PIPA House. PIPA House or Pizza Pasta House is the first to offer deep-fried pizza crust in the metro (if not, the whole country). The chef and owner, Chef Dondon, got the idea when he worked abroad. The concept of deep-fried pizza crust, he shared with us, started in UK. We started with Michael Mojordan (Php 59) and a pitcher of John Lemon (House Blend Iced Tea, Php 99). 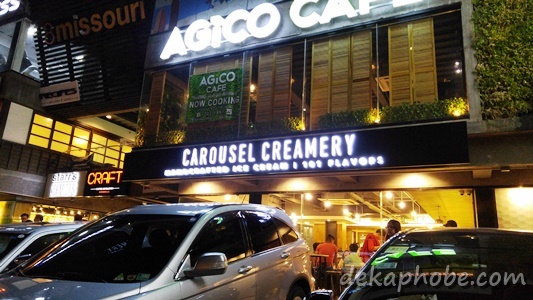 A stressful day at work led my friends and I to Manila's hottest cold place right now: Carousel Creamery in Greenhills San Juan. 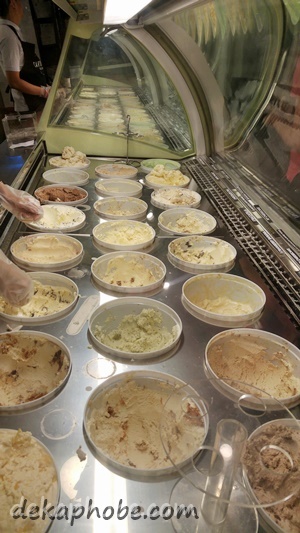 Carousel Creamery is the only ice cream shop in the metro that sells all 101 flavors the same time. 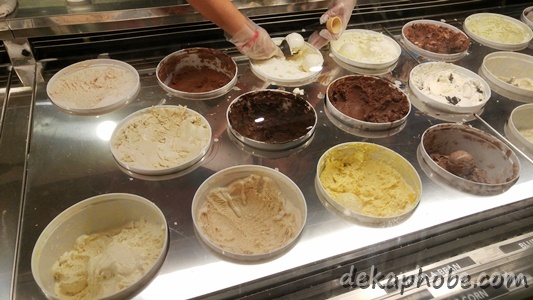 So yes, for an ice cream enthusiast like me, choosing flavors took a long while. We decided to all get Triple Scoops (Php 200) so we can try as much flavors as we can, but let me tell you now that this made our decision more difficult than ever. Flavors range from the classic Chocolate, Vanilla, Cookies and Cream to weird ones like Beer & Chicharon, Bacon & Cheese, Puto & Cheese and Tamarind Chili. I was recently invited to dine at the newly-opened hotel in Araneta Center in Cubao: Novotel Araneta Center Manila. 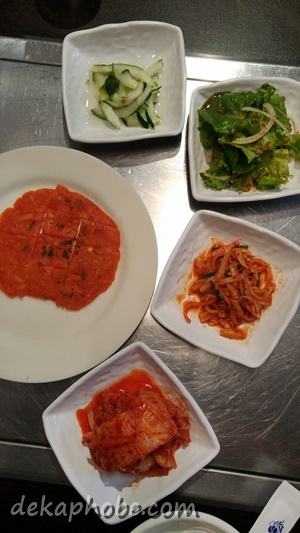 We were able to try their casual dining bar and restaurant, Gourmet Bar by Novotel. Gourmet Bar is the signature lounge bar of Novotel Hotels around the world. This modernist bar and cafe serves a variety of international cuisine, along with an impressive line of drinks. For starters, we were served freshly-baked breads and butter, and sampled Pan Seared Local Buffalo Mozzarella & Vegetable Salad and Norwegian Salmon with Chives Burrata Espuma, along with a glass of Unleaded Cucumber (Php 180). The local buffalo mozzarella is fresh from the Aranetas' El Dorado Farm, paired with greens while the salmon with chives burrata espuma is garnished with crispy sweet potato and avruga caviar. I love the textures and the contrast of sharp and creamy flavors in this tasting plate, though I am partial to the Norwegian Salmon. I would love to have more of this. I enjoyed the Non-Alcoholic Unleaded Cucumber, with soda, lime, cucumber, mint leaves and house made sour. I really love any drink with cucumber and I love that they have this drink here. The boyfie and I both love the relaxing ambiance of Tagaytay, hence we returned for a few days of cold weather and quiet. 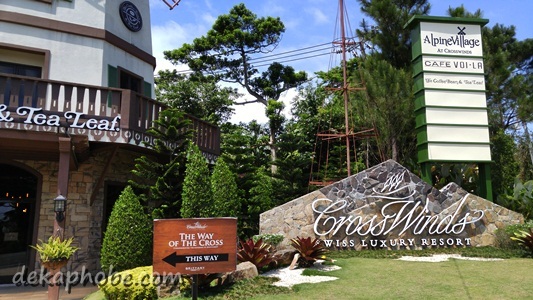 We booked our accommodations at Crosswinds Resorts Suites, located inside Crosswinds Tagaytay. Crosswinds Tagaytay is a 100-hectare Swiss inspired property located on the hillside of Tagaytay. All rooms are complete with kitchen and dining equipment and the hotel, so you can bring your own food or have your meals delivered with no corkage fee. We booked a Studio Queen (Published Rate: Php 6000) for our stay. Our room includes a queen size bed, a work desk, LCD TV and DVD player. It also has an electronic safety box, dining amenities, kitchen (with stove, microwave and cooking equipment), and refrigerator. I love Japanese food and I have always wanted to learn how to cook my favorite Japanese dishes, and I was really happy to be invited by Kikkoman to attend their Oriental Cooking Master Class at 25 Mushrooms Kitchen in Pasig City. Kikkoman, the world's leading soy sauce brand, is made with the finest ingredients and brewed to authentically oriental perfection. 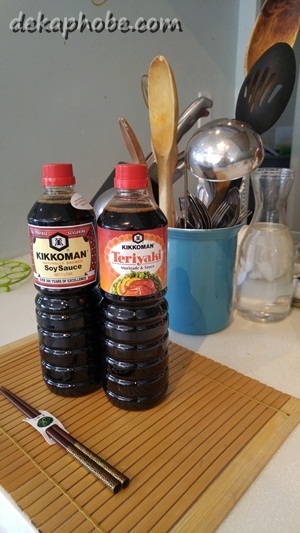 Compared to other soy sauce brands, Kikkoman is brewed naturally and aged like wine to achieve its oriental taste. 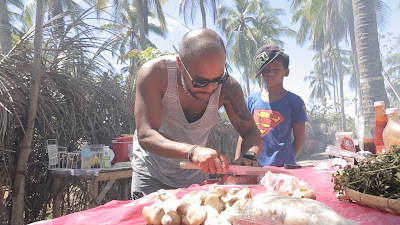 This will be quite a lengthy piece as I will be sharing with you the recipes of the Japanese dishes I have learned to cook at 25 Mushrooms Kitchen with the help of Kikkoman, of course. I made a Sushi Platter, Pork Katsudon and Beef Sukiyaki. We have made a sushi platter using fresh seafood: uni, salmon, kani sticks, tiger prawns and tuna. 1. Wash the Japanese rice until water is clear. Rub the rice with your fingers to remove starch. 2. Soak in water for 15 minutes. 3. After washing and soaking Japanese rice, cook it in the rice cooker. 4. To prepare sweet vinegar, mix vinegar, sugar and salt in a saucepan. Put the pan on low heat and heat until the sugar dissolves. Cool the vinegar mixture. 5. Spread the hot steamed rice into a large plate or large bowl. Use a non-metallic bowl to prevent any interaction with the Japanese vinegar. Sprinkle the vinegar mixture over the rice and fold the rice. 6. To cool and remove the moisture of the rice, use a hand fan or electric fan. This will give sushi rice a shiny look. We were instructed to make sure our sushi can be eaten in one bite. 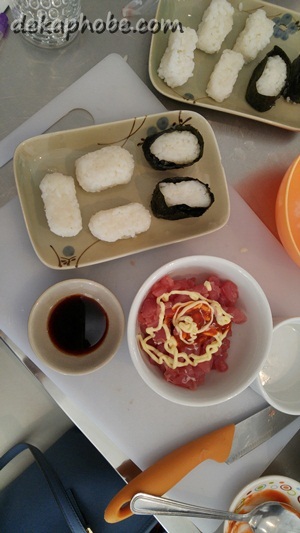 We were also taught how to make our own Spicy Tuna filling for the sushi. 1. Slice tuna into small cubes. 2. Add Japanese mayo, Kikkoman, hot sauce and togarashi powder. Combine these ingredients according to your taste. 3. You may put this on top of the sushi or use it for salad.